Precision Screwdriver Set 0.6mm - 2.6mm Flat Blades 6 pieces Vigor SD-764 | QTE North Amer | QTE North America, Inc. Precision screwdrivers with chuck style blade retention. Highest quality tempered steel blades. Hexagon swivel head keeps them from rolling away. This mini-screwdriver set is perfect for use on jewelry, watch parts and eyeglass repair. Measures 4" overall, screwdriver body is 1/4" in diameter. 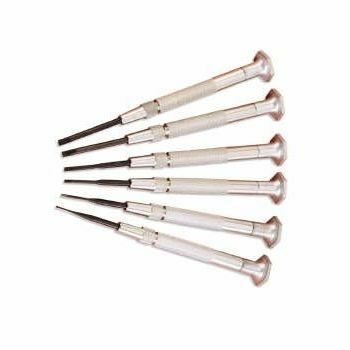 Replacement screwdriver blades are available for this series of precision screwdrivers.